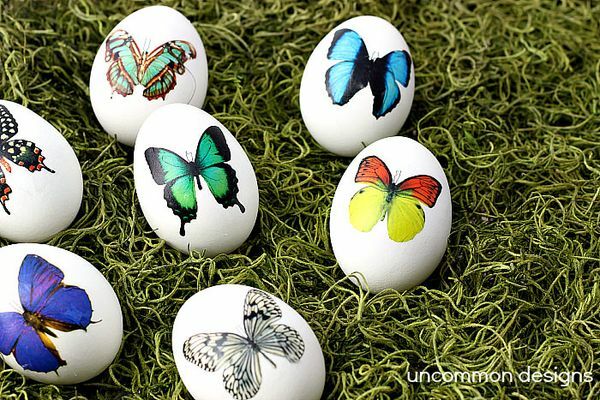 Make your Easter eggs stand out as completely one of a kind this Easter with these Temporary Tattoo Easter Eggs. If you don’t have the artistic touch for painting, you can just stick temporary tattoos onto the eggs in minutes using a little bit of water. Well, the name pretty much says it all. Temporary tattoos applied to hard boiled eggs. What an awesome idea though, and a much less messy way for decorating eggs this Easter! You can use more traditional Easter designs like bunnies or butterflies, or you could opt for your kids favorite characters instead like Batman or Mickey Mouse. If you can tattoo it, you can do it!